On the first day of yet another Thailand fishing trip Lee from Hong Kong and his dad visited Palm tree lagoon fishing for Arapaima. After landing a few small Mekong Catfish and a Rohu of an estimated 20lbs the predator rod fished in a quiet corner of the lake suddenly came to life and after a spirited battle a Redtail Catfish was brought to the bankside. An extremely big Arapaima showed several times over the baited area surfacing to breathe oxygen before diving back down into the depths. After casting a float fished deadbait into the immediate area it was not long before the float buried beneath the surface and the fishing rod took on a healthy curve. 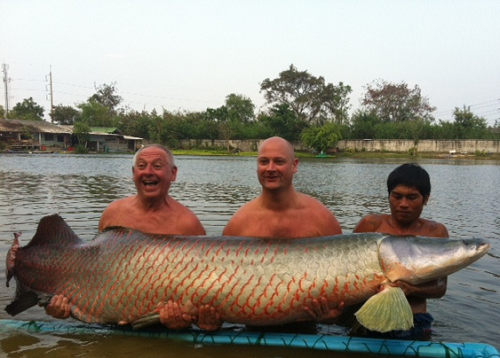 The Arapaima embarked on a series of powerful runs towards the centre of the lake ripping yards of line from the tightened spool of the reel. On several occasions the monster Amazon predator rocketed up trough the surface layers before launching itself skyward and angrily thrashing its head from side to side. Almost twenty minutes after hooking the Arapaima the fish started showing signs of fatigue and slowly made its way towards the net. On netting the Arapaima thrashed its head violently in an attempt to shed the hook requiring three guides to subdue the monster fish and carefully place the Arapaima in the recovery cage. The stunning Arapaima was observed to have a massive length of over 2 metres and was estimated to weigh somewhere between 160-180kgs. The fish was allowed several minutes for recovery and was quickly photographed before being allowed to swim off into the lake.